Ford and SunPower team up to provide a high-efficiency rooftop solar system that will provide Focus Electric owners enough renewable energy production to offset the energy used for charging. Ford and SunPower team up to provide a high-efficiency rooftop solar system that will provide Focus Electric owners enough renewable energy production to offset the energy used for charging. The 2.5 kilowatt SunPower system will produce an estimated 3,000 kilowatt hours of electricity annually. SunPower systems are backed by a 25-year warranty. Ford's aggressive electrification strategy includes the launch of five electrified vehicles in North America by 2012 and Europe by 2013. The new Focus Electric is a zero-emissions, gasoline-free version of Ford's popular global Focus model. 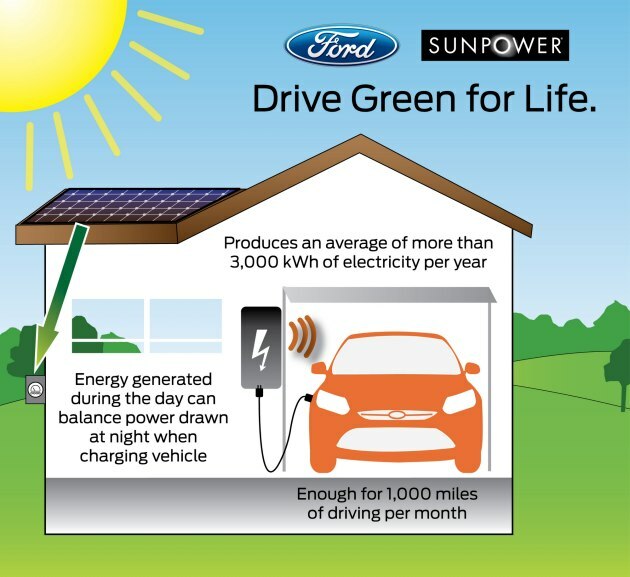 Ford and SunPower Corp have teamed up to offer customers a rooftop solar system that will allow Focus Electric owners to "Drive Green for Life" by providing customers with enough clean, renewable energy to offset the electricity used to charge the vehicle. "Under the 'Drive Green for Life' program, Focus Electric owners can reduce their total cost of ownership by generating enough energy from their high efficiency SunPower rooftop solar system to offset the electricity required to charge the vehicle at night," said Mike Tinskey, Ford director of Global Vehicle Electrification and Infrastructure. "It's an eco-friendly solution that perfectly complements our plug-in products and other green initiatives." "SunPower's innovative partnership with Ford is a win-win for customers, providing a comprehensive sustainability program," said Tom Werner, SunPower president and CEO. "By taking advantage of this program, Focus Electric customers can receive the added benefit of installing a SunPower solar system, the highest-efficiency, most reliable on the market today, generating the electricity needed to charge their vehicles." The 2.5 kilowatt rooftop solar system is comprised of the SunPower® E18 Series solar panels that produce an average of 3,000 kilowatt hours of electricity annually. These high-efficiency solar panels generate approximately 50 percent more electricity than conventional panels and utilize a smaller footprint on the roof. The system was sized to accommodate a customer who drives about 1,000 miles per month. The complete SunPower solar system is offered at a base price of less than $10,000*, after federal tax credits. Local and state rebates, along with other incentives, may drive the system cost down even more, depending on a customer's location. Included in the purchase is a residential monitoring system, which includes the ability to track the performance of their solar system on the web or through an iPhone application. Affordable financing options for the solar system are available through SunPower. This price point does not include local sales tax. Interested Focus Electric customers will be contacted by a participating SunPower dealer who will visit their home to begin the installation process. SunPower leads the industry with more than 400 dealers in the U.S., and can support the initial Focus Electric roll out in all 19 markets. In addition to the Focus Electric, the SunPower rooftop solar system will be compatible with the C-MAX Energi plug-in hybrid electric vehicle Ford is rolling out in 2012. 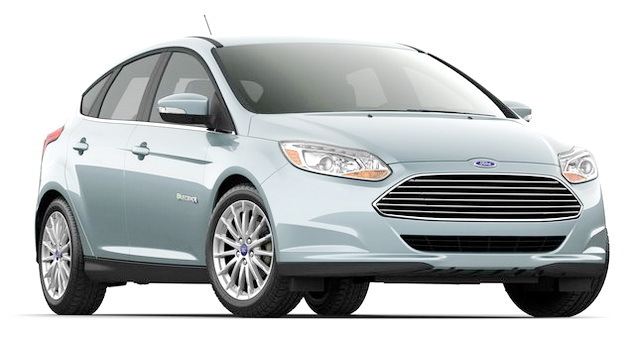 By partnering with SunPower, Ford now offers Focus Electric owners two complementary charging solutions to make the overall experience of owning an electric vehicle easier. In January, Ford announced an agreement with consumer electronics leader Best Buy to offer a 240-volt home charging station for the Focus Electric and future electric vehicle owners. "The goal of working with both SunPower and Best Buy was to offer Focus Electric owners solutions to charging needs that help lower the vehicle's overall cost of ownership," said Tinskey. Electrification is an important piece of Ford's overall product sustainability strategy, which includes the launch of five electrified vehicles in North America by 2012 and in Europe by 2013. Ford launched the Transit Connect Electric small commercial van in 2010 and will launch the all-new Focus Electric later this year. In 2012, these models will be joined in North America by the new C-MAX Hybrid, a second next-generation lithium-ion battery hybrid and C-MAX Energi plug-in hybrid. This diverse range of electrified vehicles allows Ford to meet a variety of consumer driving needs. *This offer assumes normal installation conditions, not including modifications to a roof, electrical service panel or excessive wire requirements.